There is an ancient game depicting the tale of how humanity changes from one era to the next. Two dragons have since dawn of time influenced humanity’s direction. In between eras, they struggle against each other to determine anew which will hold sway over us for the next hundreds of years. One is Tianlong, the sky dragon, the other Dilong, the earth dragon. Both are beholden to the Tao, which itself is manifested through the Ba-Gua. The Ba-Gua, or “the eight signs”, is the wheel of trigrams, each representing an element formed by a singular combination of two opposites – Yang and Yin, also known as the order and the chaos, spirit and matter, action and reaction, vertical and horizontal, clockwise and conterclockwise, the sky and the earth, the father and the mother of everything. 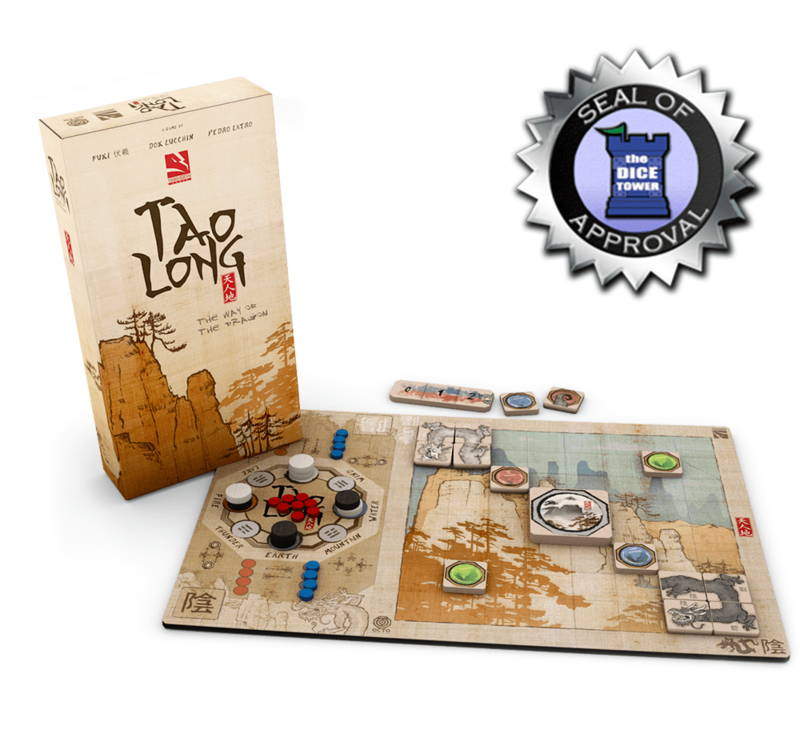 Inside the box you will find the game rules in english, however, we have translated the Tao Long rulebook in six different languages. If you have any question, tweet us @tgryphgames with the hashtag #TaoLong and we will reply promptly! Share Tao-Long with your friends! Looks cool. I like the artwork of the board, really likes chinese painting with water colour. The rulebook is beautiful but I wish that the fonts used in the text were’nt the same font used in the heading and caption. It was a bit dizzy to read the long explanation with that kind of font. Loved the flow of the artwork. I agree on the text sort of all melting together making it difficult to read. Looking forward to backing this game. Also I love 2 person games. I like it a lot! The flavor and the theme comes through strongly, however I believe there should be some separation between flavor text and rule definitions and that the bold text does not do it enough. Maybe placing the flavor text to the side with some artwork would be a nice touch. Otherwise, I love the feel, reminds me of Tsuro but I can see more complexity to it which is something I always thought Tsuro could use. Look forward to seeing more when the project launches. Reminds me of Onitama! Excited to try it out. The game looks great! The art is outstanding and the game play looks intriguing. I cannot wait to back it! I think the font type used in the rulebook is not appropriate. I think pages like page 10 and 14 need to “break” the “wall” of text with some small pictures or diagrams reinforcing the explanation, like remembering the reader, that may be unfamiliar with the terms, what the Ba-Gua is, for instance. Thanks. I totally agree with you, Amarice! 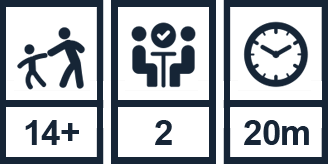 We are definitely working on perfecting the rulebook layout, and changing the fonts and breaking huge text blocks are the next steps to be taken 😀 Thanks for the consideration! The games coming out of this studio are really promising! Thanks guys! I love the theme and art style. I love most oriental themed games to begin with but the differences between how each element works are really intriguing! Looks great, love the artwork. Can’t wait to play this. Love the art, of course, but I particularly like the direction you’re going by thinking of the whole product right from the beginning. The graceful expression of a game should include the fact that it is no larger than it needs to be, whether on the table or on the shelf. Besonders die Grafik gefiel mir als Erstes! Und nachdem ich mir die Regeln durchgelesen habe, bin ich gespannt auf das Spiel. This game looks great, especially the artwork, which is wonderful and the gameplay is unique. A must have game! The art of Tao Long in the game pieces and the rulebook is very appealing and reminiscent of traditional Chinese paintings yet is also modern. I really like the theme and look forward to trying it out soon! I love this beautiful artwork. The rulebook looks good either, but I would try to change the bold style and make course some fat headlines. The rules themselves are clear and I think I will be a backer, if it’s on KS. Under game end, bold “lost its third segment” . Bottom of page 5, “and the portal tiles enable direct moves from one tile to the other, even if they’re apart on the board.”, the word ‘apart’ has an odd nuance sense here in that all tiles are apart from one another. I suggest rephrasing this “and the portal tiles enable direct movement between any two tiles”. I love 2 player games, reading The rulebook right now. Congratulations The game looks beautiful. The rulebook design is a work in progress so you can expect some changes in that regard. Like Overseer, the look ans art are amazing. Will you include some references cards? On page 6 the text about the goal shouldn’t be connected to the headline. Just delete the word “To” and start with “Defeat”. Saying this just by reading the rule book, I’d absolutely love to play the game and it’s different modes. We’re taking a look at that page, some other people commented feeling a bit confused. Thanks for the specific tips, and for bringing up the tipos! Regarding wind and thunder, you just cannot do their moves if you’re facing the “right” (actually the wrong) direction. This prohibition is mentioned back on the Spirit Phase page. The game looks beautiful and the rulebook is clear. I especially appreciate the summary of the moves on the last page. I leapt on this based solely on the strength of your previous Overseers project. The rules for this new game seem clear and concise, though I confess I did have to read the section about absorbing and expelling fire/water a couple of times before the sank in. Will there be a PnP version of this available for those of us who are too impatient to wait for this to arrive? – How can I be confident about my extra playmat bought through this site and my Kickstarter Pending pack will be sent together in the same ‘shipping package’? Hi, we spontaneous felt in love with the game at Essen two days ago and buoyed a copy with the promise that we´ll find the german rulebook on the website… could You please make the download possible for a translated german version? Hi, I have one Question concerning the „The Valley“ Scenario: If I enter the blue portal to exit the red portal, will I have to return both a fire and water stone? The rules say, I have to return a stone to „use“ a portal, but it is not quite clear if exiting via one of them means „using“ them. Thanks! I looking of the German rulesbook for tao -long. Who can help? When will this game start shipping from retailers? I can’t wait to get my hands on it. I am wanting the deluxe version, is there any chance of getting that? I didn’t see the kickstarter before it closed.